Well, I finished up my little girl’s “deer” dress (the focal print is a deer print) and we both absolutely love it! So much so that I’ve already cut out fabric for 4 more. However, I’m thinking I’ll go back and cut out enough for 2 more. For the contest you must make 5 articles of clothing and be able to make 6 different looks from them without including other items of clothing and it takes a minimum of 2 pieces to make a look. Therefore a dress alone is not allowed. I’m thinking for each mini wardrobe I’ll make her 3 dresses, 1 raglan sleeved top, and 1 pair of leggins. From my calculations I could get more than the 6 required looks from those options. However, I’m also considering hacking the Ruffle Sleeve Top from Peppermint Magazine to fit her so she can wear those under the dresses as well. Hmmmm. We’ll see. Yes, the options are focused around dresses simply because that is what my youngest wears. Period. In order to get her to wear sleeves and leggings when it’s cold is to have a dress on over them. LOL That’s just the way she is and I’m fine with that. My girl is growing, and therefor needs new clothes. She’s all about her dresses! According to her, girls are supposed to wear dresses – that is 110% her thoughts and idea. Anyhow, I’ve found an adorable pattern that I can think of a bunch of ways to switch up to change the look. This is McCall’s pattern #5613 in sizes 7-14. Personally, I prefer the scooped neckline because I feel that the straight top shows too much. Anyhow, I’ve just finished the first dress from this pattern and both her and I love it! I had the fabric pulled for it for almost a month ago, but never even cut it out until this past Friday. Typically, when I find a pattern that’s (1) not too fiddly, (2) something she likes and approves of, and (3) can be made from a variety of fabrics for different looks I’ll make up one and then if our opinions are still good, I’ll make up a bunch of them in different fabrics / colors. I’m loving this pattern because she can wear it as is for hot days and when it’s cooler, she can layer it with a top and leggins underneath. 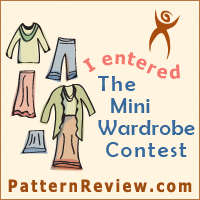 I’m going to be entering the Mini Wardrobe Contest hosted by Pattern Review and I was thinking I’d do clothes for me. However, I’m now thinking that I’ll do her’s first. If I’m being completely honest, I’m hoping that I have enought time and energy to enter 2 wardrobes for her and 2 for me but I *highly* doubt it. LOL Realistically, I’ll be lucky if I get 1 mini wardrobe for each of us done. The first plan is for 4 more of those dresses and a raglan style shirt for her to wear underneath. Well, I’m off to go cut out some fabric. Wish me luck!